Friday night, Dane Cook rocked the house hard with his ISolated INcident Global Thermo Comedy Tour at the 1st Mariner Arena in Baltimore, MD. I had the privilege of reviewing the show from amazing seats thanks to the wonderful people at 1st Mariner. I have been a fan of Dane for a long time now and I am clearly not alone, as thousands of people filled the huge arena. Think Britney Spears' crowd level. It was that big. Here's something you need to know about Dane and this particular tour. This is his first time touring since losing both of his parents. His mother passed away first from cancer and shortly thereafter, his father became ill with cancer as well and died within nine months of his mother. So it would be hard for anyone to pick themselves up after such a loss, much less find laughter once again. But Dane performed with energy and zest in honor of his parents, who were his biggest fans, and even included them in his routine. He called the show his "therapy." One of the best parts of the show in fact, was about how Dane's parents got to see the good part of his fame (such as the packed arenas) but not the bad. Which would include the haters that come along once you're a celebrity. Dane had me both laughing and cheering him on as he recounted stories on that issue (I won't give away any of the jokes). And what he revealed, to me at least, was that he has a HUGE heart. This is a guy who can crack jokes about the most crude things in one breath, and then turn around and make you laugh about very profound, deep moments from his life. That not only takes talent. That takes guts. And the crowd loved him for it. More proof of the big heart that lies beneath the animated, boyish exterior: directly in front of me were a group of Marines who yelled out "Oo-rah!" Dane heard them and knew right away they were Marines. The jokes Dane tells for ISolated INcident lean heavily toward the sexual. There were less of the type of jokes I love best from him (car alarms and parking garage squeals, the friend nobody likes, don't get on the flight, pickles, etc. ), but I was still laughing until I cried. I did hear others commenting on the same thing, though as we left the show so I wasn't the only one who noticed. One thing that I found funny....the girl next to me visibly tensed up every time he cracked a crude, sexual joke and all I could think was, "What are you even doing here? Don't you know what Dane Cook is all about?!" Seriously, if you're that easily offended you do not want to go to a Dane Cook show. Everyone else around me was in hysterics, though. I think the girl might have been brought to the show as a date by the guy she was with. Man did he read her wrong if that's the case! If you're a Dane Cook fan, you know that nothing is too offensive and nothing is off limits for him - politics, racism, and even the death of his own parents were all part of his act. Which just proves that humor is what makes Dane tick and if you have an open mind and a good sense of humor, you will totally get him. ~Visit Dane Cook's official website here. You can also find him on Twitter here. 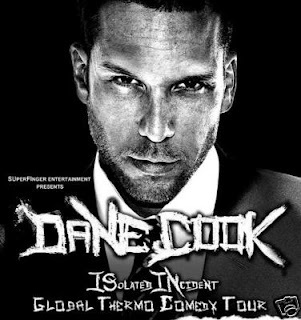 ~Click here to see upcoming dates and to purchase tickets for Dane's ISolated INcident Global Thermo Comedy Tour. ~For more information on the 1st Mariner Arena in Baltimore, Maryland, click here. ~Follow Dane on tour with the VIP Pass iPhone app. ~Watch the "ISolated INcident" television special on Comedy Central, May 17. ~Purchase "ISolated INcident" on CD and DVD, in stores everywhere May 19.